Finding the perfect balance in a modern and spacious Niagara-on-the-Lake home. 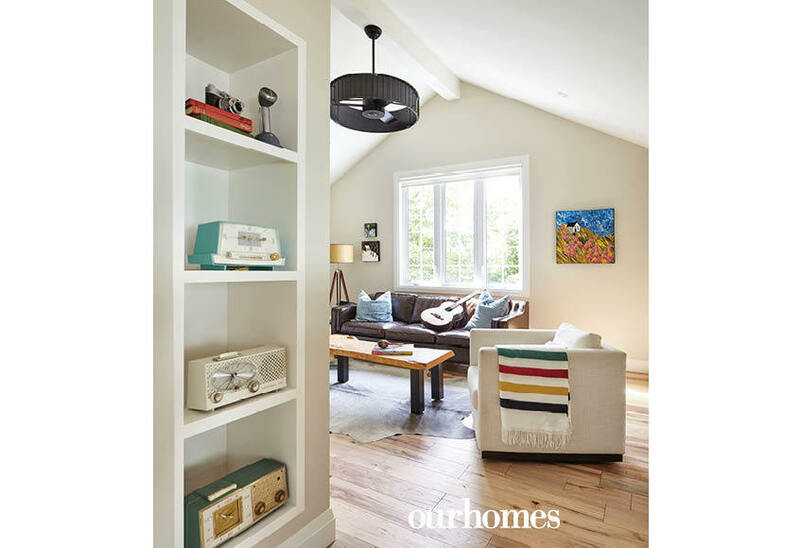 A version of this article originally appeared in the Fall 2018 issue of OUR HOMES The Niagara Region, p.48. Find local businesses in our Niagara directory. 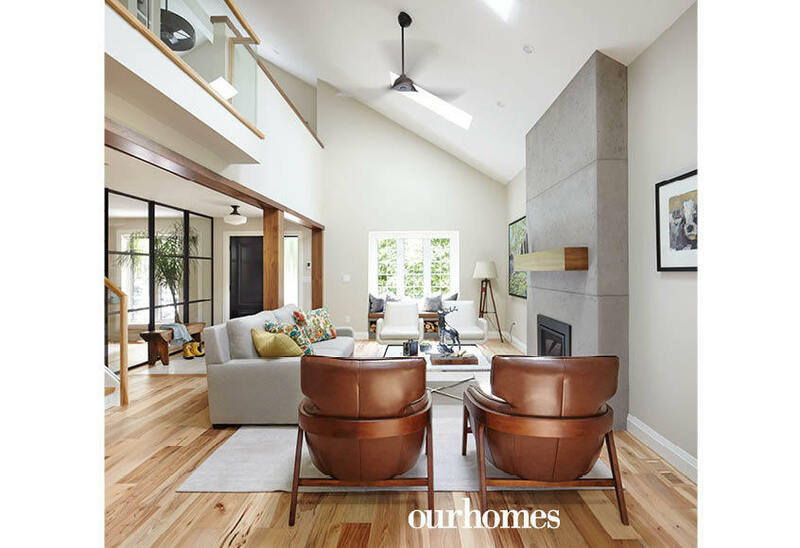 Here’s the trick to combining rustic, industrial and vintage styles to create a home that feels modern, spacious and flows effortlessly while keeping with Niagara-on-the- Lake’s charm: collaborate with a designer who knows how to pull together the perfect balance. Gail enlisted the expertise of interior designer Tracy Clipsham from Liv 4 Design. Tracy’s design was brought to life by builder Roger Provost from Property Rehab who was critical to the construction side of the project, which allowed Gail and Tracy to focus on coordinating the specialized tradespeople to install the design elements that are reflected throughout the home. By updating windows and taking out dividing walls between the living and dining spaces, light now streams into the main floor. Vaulted ceilings and skylights provide a sense of spaciousness. The interior is pulled together by the use of walnut beams that runs the length of the downstairs from the front door to the kitchen at the rear. 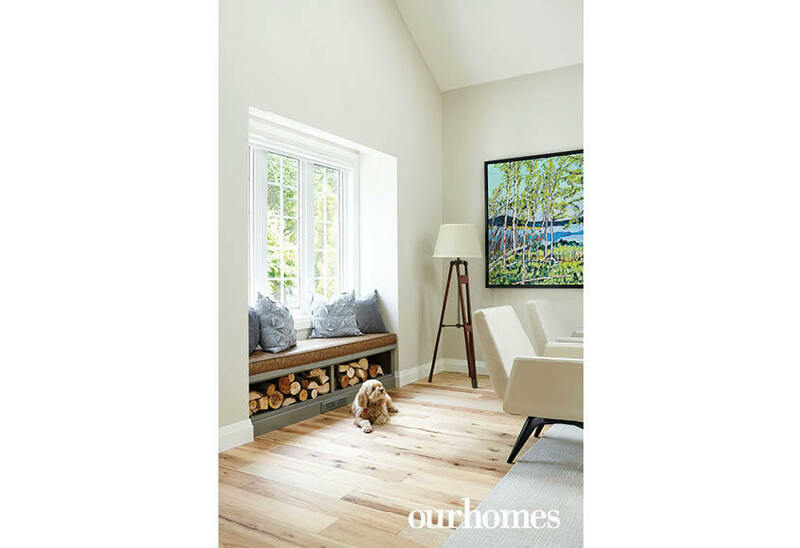 Walls are painted with colour from Creek Road Paints, including Benjamin Moore’s Natural Cream, while Cloud White covers trim and ceilings, making the space feel entirely unconstrained. The fireplace, by The One Stop Fireplace Shop, with Dekko Concrete surround and propeller-style ceiling fans could be straight from a warehouse conversion. A window seat is designed to store firewood, adding a rustic element. 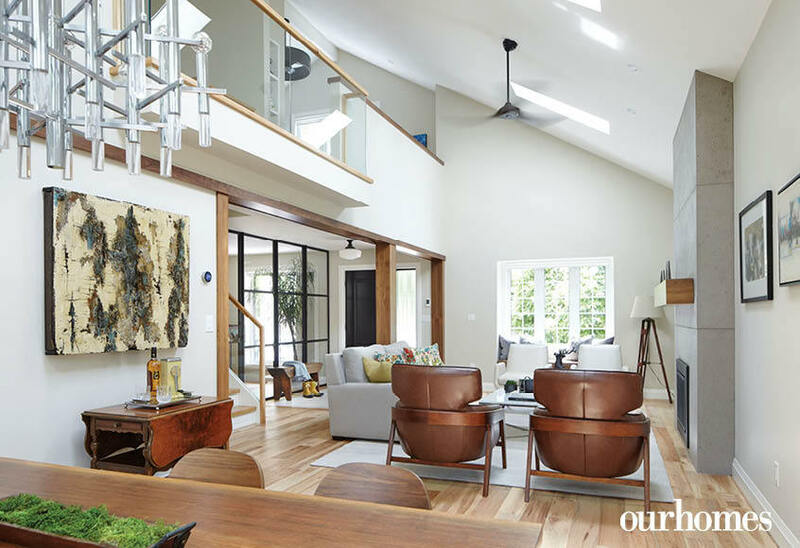 Modern leather chairs in the living and dining rooms add warmth and provide structure to the open floor plan. They are complemented by features like the vintage chrome chandelier, marble-and-chrome coffee table and enviable Carrara marble backsplash in the kitchen. Kitchen cabinets, along with the built-ins in the media room and bathrooms by Wingers Cabinets add a traditional touch. 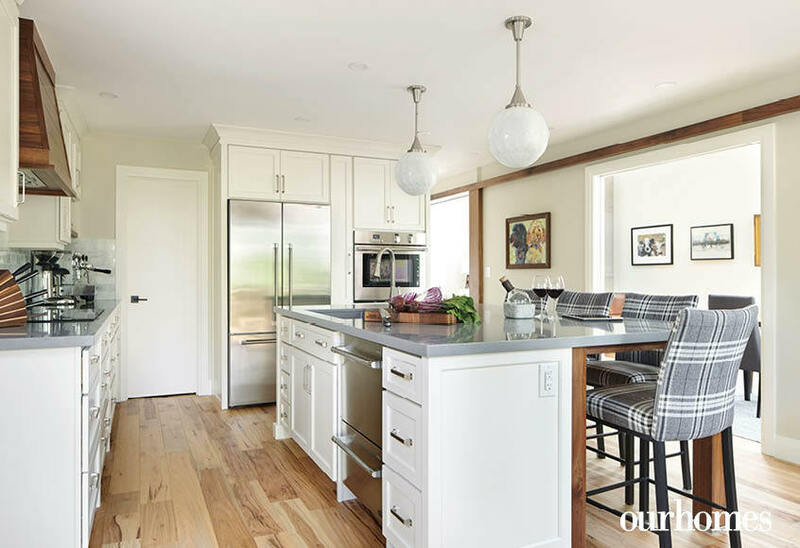 An oversize kitchen island with Cambria quartz, designed and sourced by Liv 4 Design is perfect for Gail’s love of cooking and entertaining guests. Upstairs, a half-wall was created by moving the master bedroom and bath from the front of the house to the back. Tracy then turned this space into a contemporary media room. An internal glass balcony with walnut railing overlooks the main floor and lets light stream in from the second-floor windows. A guest suite over the garage offers guests a spa-like experience. An intricate custom glass chandelier is a focal point. 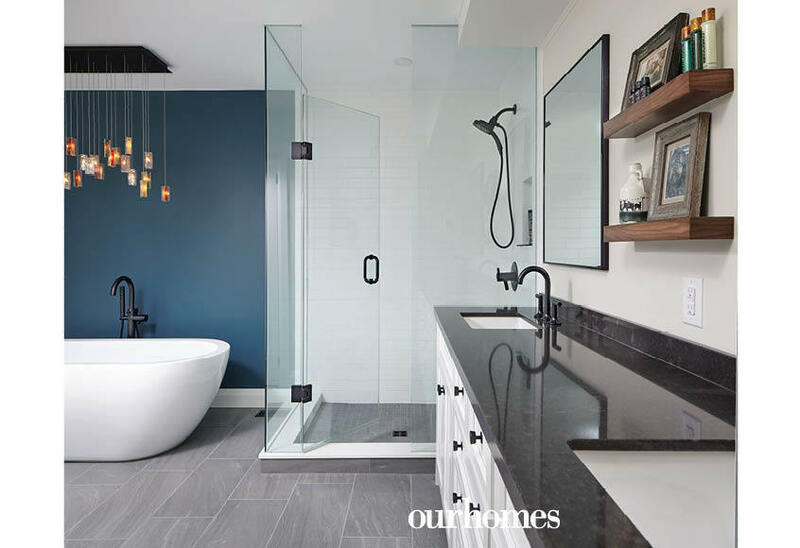 The large, free-standing tub adds to the luxurious feel while the black bathroom fixtures by Bathworks continue the modern industrial theme. Sunscreen shades on the second floor by Interiors by Better Shade cut light and add privacy without taking away from the bright, airy feel. 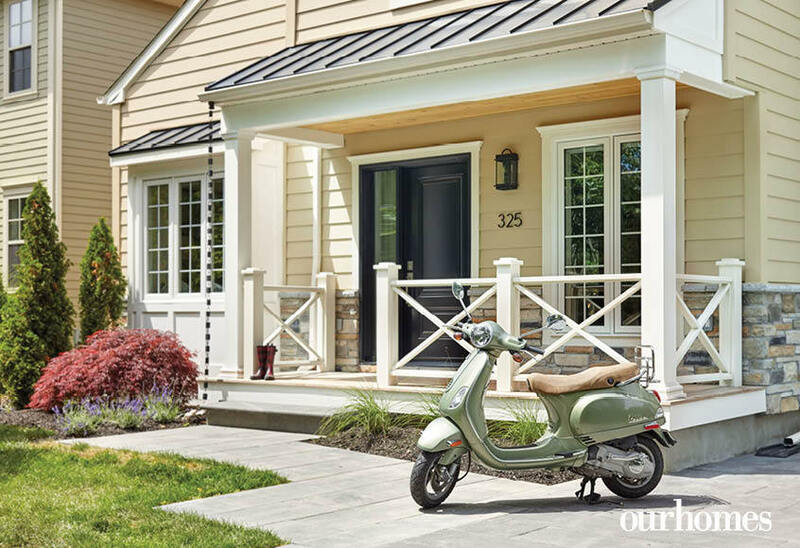 To better reflect Niagara-on-the-Lake’s charm, the exterior got an extensive transformation, including a front porch, back deck, and a guest space over the garage to balance out the formerly lopsided-looking house. A new driveway and plants provide the finishing touch. The home’s transformation included a significant facelift outside that saw a front porch added. A new driveway and plants provide the finishing touch. 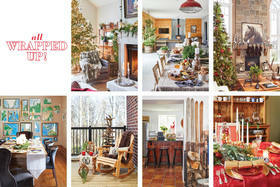 Interior designer Tracy Clipsham of Liv 4 Design spearheaded the overhaul of this home. 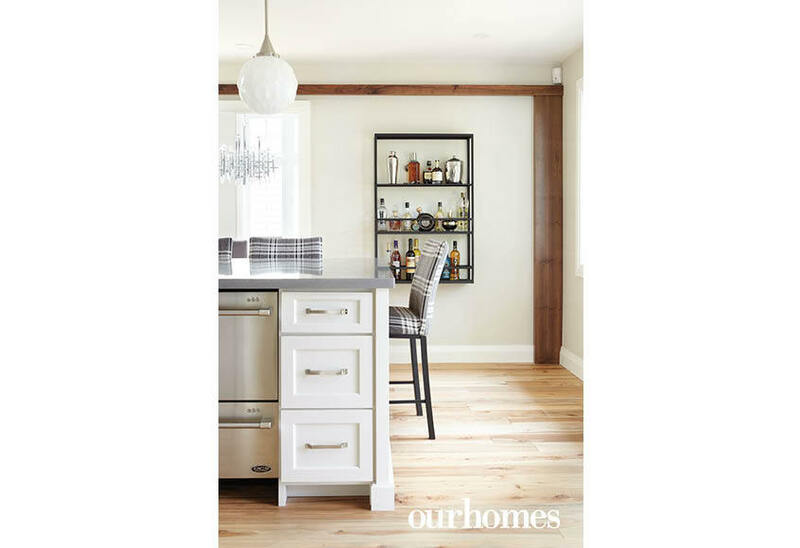 Natural wood elements throughout the home tie everything together. 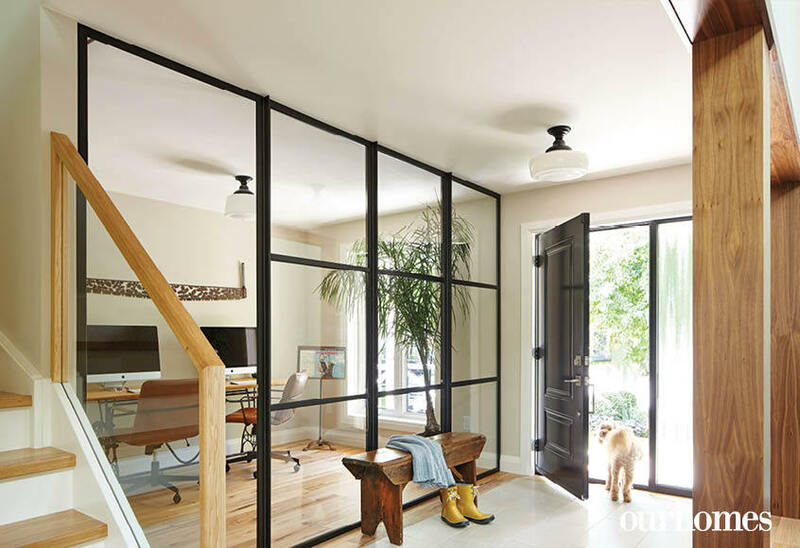 A home office is separated from the foyer by a partial glass wall. Walls were removed on the main level of the home to create an airy and open space between the front hall, great room and dining area. A glass wall enclosing the office creates separation while still maintaining an open-concept feel. A window seat with a soft faux-leather cushion in the living room is designed to store firewood, adding a rustic element. An oversize kitchen island suits the homeowners’ love of cooking and makes an obvious gathering spot while entertaining. 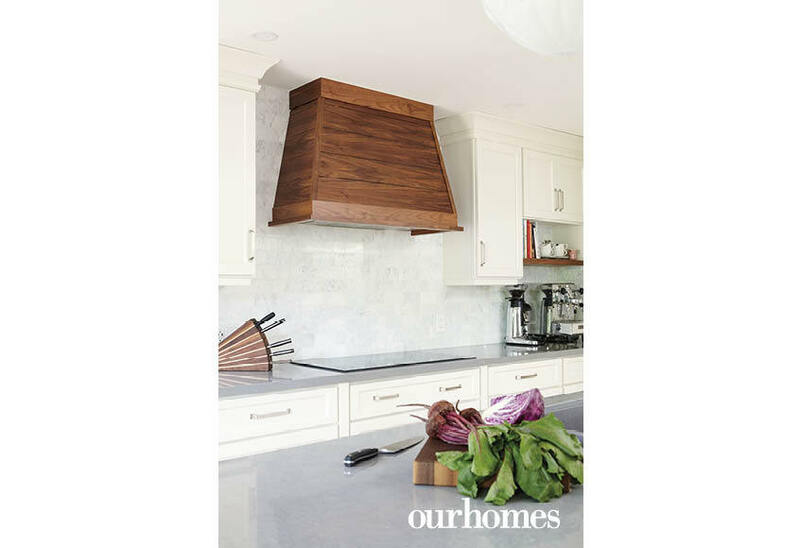 A custom range hood introduces the theme of walnut into the kitchen over a gas range. 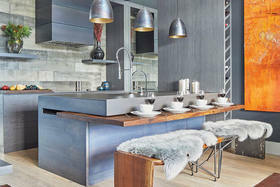 A quartz countertop with an uncomplicated design fits the home’s industrial and rustic vibe. 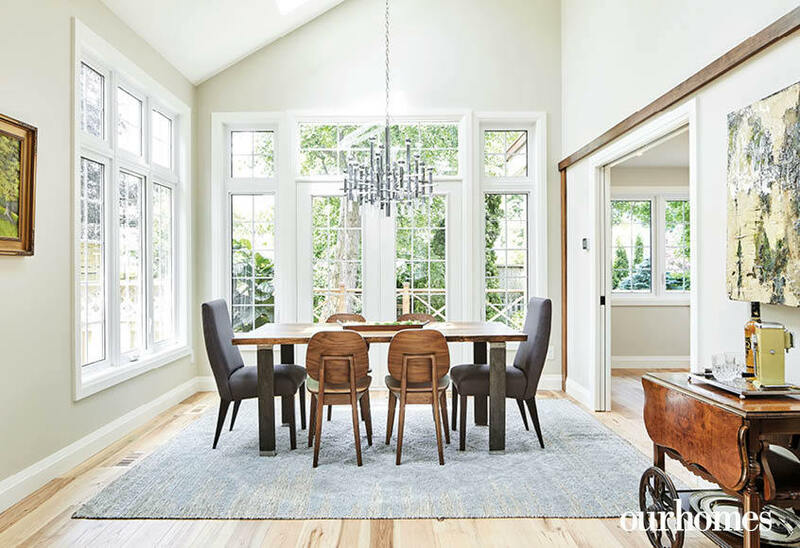 Large windows surrounding the dining area allow natural light and a view to a backyard with mature trees. A media room on the upper floor fills an area where the master bedroom once existed. Faux fur keeps the master bedroom cosy. Black fixtures in the en suite continue the modern industrial look but don’t take away from the relaxing oasis the owners created. 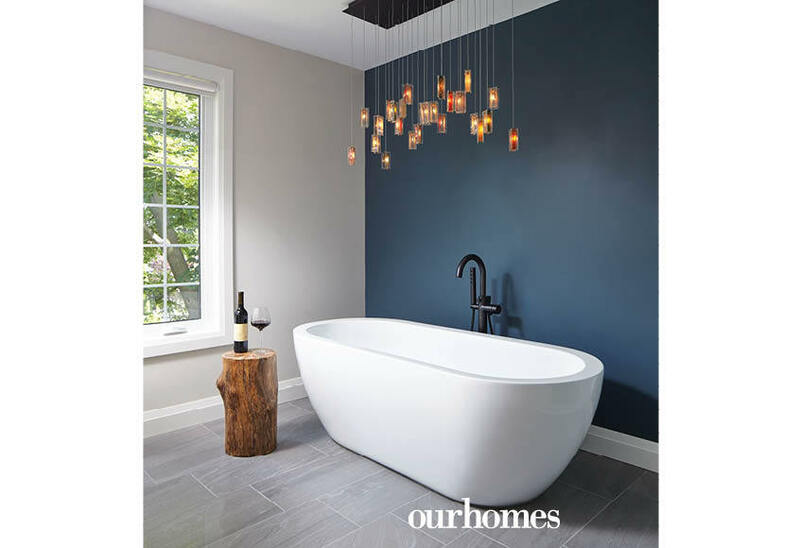 A large en suite feels like a spa retreat with a dark blue accent wall and an intricate chandelier casting a warm glow.